I am pleased to present a guest post by Daniel Markovitz. 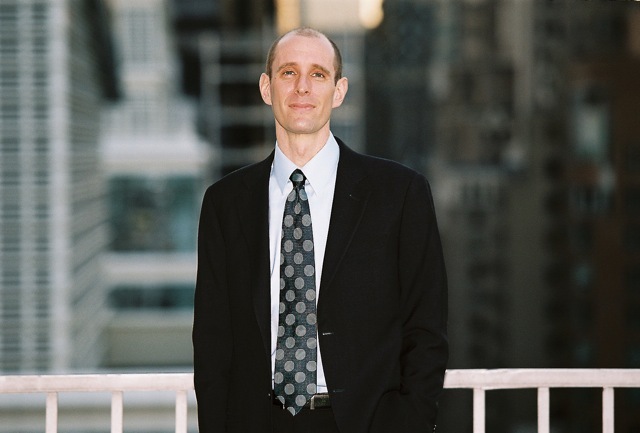 Dan is president of TimeBack Management, a consulting firm specializing in the application of lean concepts to individual and group work. He is a faculty member at the Lean Enterprise Institute and teaches at the Stanford University Continuing Studies Program. He also teaches a class on A3 thinking at the Ohio State University’s Fisher School of Business. He is the author of the forthcoming book, A Factory of One, to be published by Productivity Press in late 2011. You can reach him at dan@timebackmanagement.com or via Twitter @timeback. According to Greek legend, Odysseus plugged his sailors’ ears with wax and tied himself to the mast of his ship so that he could listen to the song of the Sirens. Sometimes I think we need a similarly drastic approach to email (and attention) management. However, given that you’d have a hard time explaining to the HR department and OSHA why you’re asking your staff to shove beeswax in their ears, I thought you’d appreciate what I’ve done. Within the lean community, Tim McMahon, Jon Miller, and I have been publicly exploring ways in which we can use a kanban to help us make our knowledge work visible and better manage its flow. (Jon’s posts are here, Tim’s are here, and mine are here.) Recently, I deployed my kanban as armor against the dreaded incursion of reflexive email use. Tim and I have both preached long and loud about the evils of squandering your day processing email. But I, at least, sometimes have feet of clay, and end up spending more time in my inbox than is healthy. In this picture of my kanban, all of my work-related tasks are written on pink post-it notes. Nothing special there. 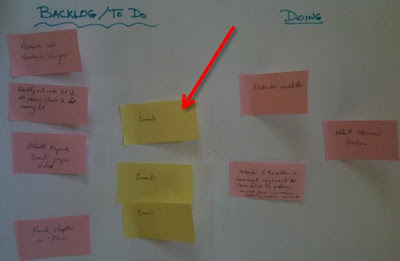 However, you’ll notice three yellow post-it notes in the “To Do” section of the kanban. These are my “email production” signals. There are only three of them, meaning that I can only go into my email inbox to read or write new messages three times during the day. There are no time constraints: I can use these kanban cards anytime during the day, and I can spend as much time as is reasonable processing mail. But I only get three cracks at it. Although it may seem like a waste of motion, when I’m ready to go into mail, I move a post-it into the “Doing” column, and when I’m done, I move it into the “Done” column. That reduces the number of email kanban cards in the “To Do” section, which is a powerful visual signal about the limits I’m placing on email use. This technique has been very effective in keeping me focused on key tasks and projects. It’s also easier than tying myself to a mast or putting wax in my colleagues’ ears. Great idea, Dan. I may have to incorporate something similar into my kanban board. Thanks for sharing that helpful tip. Email production kanban, BRILLIANT! I desperately need to apply that approach. I am a serial email checker. Thanks for sharing.